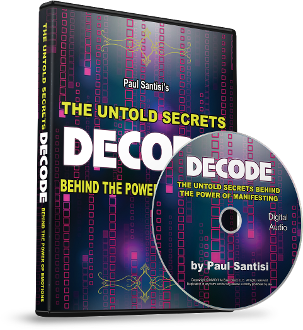 “DECODE” The Untold Secrets Behind Manifesting. “DECODE” More Of What You Want And Stop “DECODING” What You Don’t. Today is the day, that we all have the opportunity to learn something epic that will have a profound positive impact on our lives and the lives of others. I just recorded one of the most descriptive and powerful audios of my life! I recorded this audio because I personally read each and every one of the thousands of comments that pour in each month from people. With that said I am able to identify the areas of understanding that many people are still stuck on, when it comes to fully understanding how it all really works. I have observed that their are millions of people who are still suffering mentally and vibrationally on this planet. The CURE to eliminate this mental suffering is simple, in my opinion and once it’s revealed to you, it will make perfect sense. It does take some conscious effort at first to apply but after that it will become a part who you are. That this knowledge will be part of your vibration forever, it will finally put you in 100% control over yourself. I have been waiting for years for someone to share this truth with the masses, and I am yet to find anyone who has or in as much detail that I decided to. The title of this new audio is called “DECODE”. How to decode more of what you want in and life, and the second part is on how to STOP decoding more of what you do not want to keep happening. The word “manifest” is used heavily by all the gurus, motivation teachers, and authors out there. I use the word “manifest” often myself because it’s a great word, a powerful word, in fact. What I found is that many people miss how to manifest the life they want. The truth is, that there is more to just “manifesting” something in your life than simply trying to manifest. There is a needed fundamental understanding of Universal principles that you need to grasp and apply first before you can manifest anything into your physical life. You must “DECODE” emotionally what you want more of in life before you will ever manifest it. It goes way beyond the thought process. If it’s never “DECODED” on a vibrational or energetic or emotional level first you can’t manifest it into the physical because your not letting it “DECODE”. This is how most people try to manifest things. They give birth to a new want or desire. They say, I want a new car! I want a new higher paying job! I want a new bigger home for me and my family! I want vibrant dynamic health! I want to meet my soul mate! That is good, they think about and know what they want. Then the reason things do not happen fast enough or ever is that when they think about what they want, the first thought is Hmmmmm what can I do to get that? Or how will that ever happen? You see they immediately focus on the “HOW” and how = doubt. So each time you give birth to that desire and clarify what you want, most instantly push it away vibrationally by thinking about the “HOW”. You are canceling out your own expectation energetically. Then you say “well you know”, I tried that “manifesting” thing before in my life and it didn’t work. Then you go back to wasting your life trying to figure out “HOW” to do it. Let me ask you right now, how is that working out for you? It’s okay because you don't know what you don't know. After this audio will know everything you need to know to “DECODE” your life on your terms. Whether it’s money, and all the things you can do with more money, vibrant dynamic health, better relationships, attracting your soul mate, more confidence, a pleasing personality, feeling safe and secure. No matter what you want more of in your life, this audio will be a real eye and soul opener for you. It’s well over an hour long and you will provide with aha moments over and over again. Here is just a few of things that we discuss in detail. Learn how you have “DECODED” your entire life up to this point, whether you are consciously aware of it or not. Learn why “DECODING” through emotions, then thoughts is what activates the “manifesting” process amazingly fast. Learn how most well meaning people think they are sending energetic support to others in timed of need and are in fact sending counter intention. Learn exactly how to become a powerful source of inspiration and how to positively influence others with your emotions in mere seconds. Learn how to ask yourself “WHY” by observing your feelings and how this leads to crystal clear mental clarity and knowingness. This is when the “HOW” or next logical step automatically presents itself to you. Release your ability to “DECODE” your life, on your terms for the rest of your life. Become in vibrational alignment with who you really are permanently.